If meetings could change the labor movement, it would have been transformed long ago. Labor’s elected officials and appointed staff spend virtually all their time in meetings— local or national union executive board sessions, union conferences and conventions, central labor council conclaves at the city and state level, benefit fund trustee gatherings and related “training” seminars, not to mention meetings with politicians, their staff, and organizations allied or funded by organized labor. Oh, and there’s also those very time-consuming meetings with employers that dues paying members think are kind of important. They’re called “contract negotiations”—and represent just the tip of the iceberg in a year-round schedule of labor-management meeting-going. 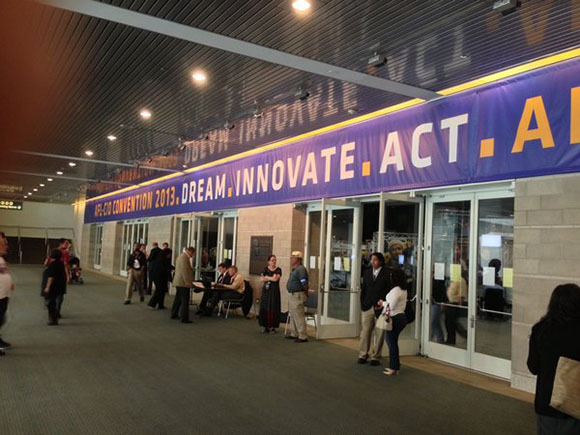 The entrance to the 2013 AFL-CIO convention. As AFL-CIO leaders and staff packed up to leave Los Angeles last Wednesday afternoon, they were basking in the glow of favorable media coverage about their own just concluded meeting. The L.A. Convention Center had been ringing with the usual-fulsome delegate praise for president Rich Trumka’s carefully scripted, tele-prompter assisted chairing of the AFL-CIO’s 27th Constitutional Convention. The feed-back was also quite positive among the hundreds of invited guests from workers centers, labor support coalitions, public policy groups, student, feminist and community organizations, and “social change” foundations. Present in larger numbers than ever before, these enthusiastic “solidarity partners” were often first-time convention goers. They were younger and far more diverse than the delegate body itself, although its own affirmative action stats are improving too. 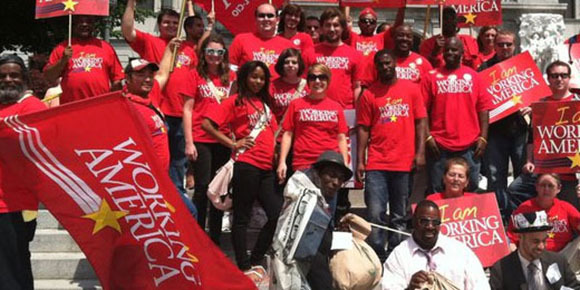 The “Alt-labor” crowd functioned as a kind of progressive arm candy for the convention. Invited guests got to schmooze with journalists, network with each other, make “action session” presentations, hold press conferences and side rallies, meet current or future union allies and foundation funders, and peddle their wares among “friends of labor” with dubious pasts. (Google Ullico/Global Crossing and you’ll get the picture.) Sometimes, brave rank-and-file activists even got airtime, on the main stage, for moving celebrations of their organizing work among fellow immigrants. All of this greatly enlivened the proceedings, giving them a progressive buzz and grassroots sheen not seen since “New Voice” candidate John Sweeney was elected federation president in 1995. His reform slate included former Pennsylvania coal miner, union lawyer, and United Mine Workers leader Rich Trumka, who also pledged to restructure the AFL-CIO. New Voicers favored new organizing and political initiatives, community-labor alliances, and anti-globalization efforts, plus expanding the role of women, immigrants, and people of color. Unfortunately, as former AFL insider Bill Fletcher reported in his book, Solidarity Divided, these “reform efforts seemed to be running out of steam” as early as 1998. After that, words spoke louder than actions, as Monsignor Sweeney just kept delivering the same old progressive sounding sermons for the next decade or more. 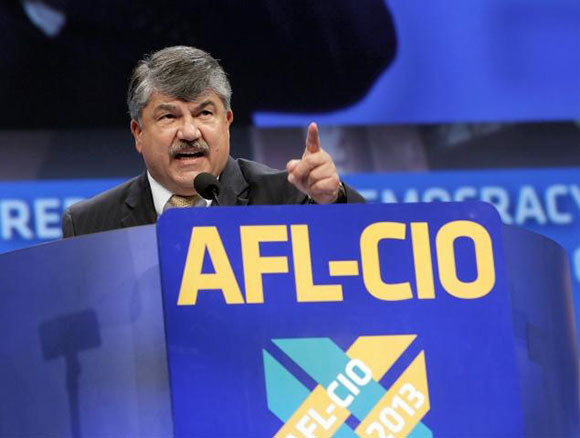 Richard Trumka at the 2013 AFL-CIO convention. Photo by Nick Ut/AP. The Service Employees International Union (Sweeney’s own union), the Teamsters, and five others grew impatient with his preaching. They bolted the Church of New Voice in 2005 for a Change-to-Win storefront, just down the street, that seemed to have livelier music. In recent years, three of those defectors have returned to their original pews, one-by-one. The largest of them, United Food and Commercial Workers (UFCW), was just re-baptized as a leading AFL-CIO affiliate last week in LA. 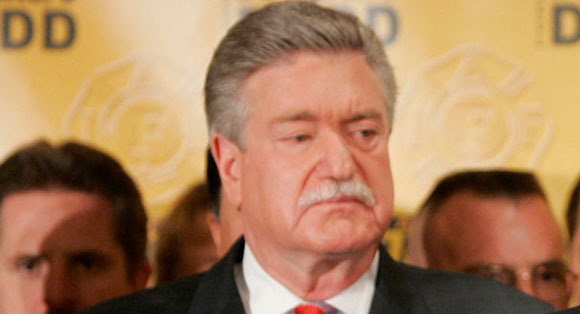 UFCW’s 70-year old president Joe Hanson dutifully expressed confidence that his new pastor, Brother Trumka, would “fight like hell to fix the Affordable Care Act,” an act of Congress (not God) now much afflicting its own faithful labor supporters. Now pushing 80, Sweeney didn’t officially retire until 2009. On his way out, he tossed the keys to “The Man from Nemacolin,” as Trumka dubbed himself in a costly documentary about his life shown at the AFL-CIO convention in Pittsburgh that year. With a mustachioed, more-energetic 64-year old at the helm—and two under-45 staffers on his new leadership team–last week’s convention proceeded to recycle New Voice ideas nearly twenty-years old. Who could be against resolutions like the one, passed last week, endorsing such “A Broad, Inclusive and Effective Labor Movement”? It’s a win-win for everyone as long as organized labor looks bigger and the controversial Sierra Club–or anyone else with a mailing list they call a “membership”–doesn’t start casting AFL-CIO executive council votes that might dilute the divinely-ordained political clout of the building trades. As one union president told The New York Times on Sept. 14, it was even time “to put some movement back in the labor movement”—a talking point lifted directly from the 30-year old slogan of Labor Notes, a Detroit-based newsletter that encourages union reform. Harold’s colleagues in the always “non-ideological” building trades have a long history of such progphobia. But, as the convention debate revealed last Wednesday, they fumbled the ball in 2009-10, on the “workers’ issue” known as health care reform. With the AFL-CIO’s active support, the Obama Administration came up with an Affordable Care Act that now threatens to put labor-backed Taft-Hartley trust funds, covering 20 million people, at a fatal disadvantage and possibly out of business altogether. (See the Labor Notes article on this.) On Sept. 11, delegates finally got a chance to discuss Resolution 54, which calls for fixing the ACA so all forms of union-negotiated health coverage don’t end up being “regressed to the mean,” as one Congressional staffer described the impact of Obamacare, in a meeting with UNITE-HERE. Take an Alt-Laborer To Lunch? The labor oratory on Resolution 54 ranged from the still overly polite (to the Obama Administration) to the downright fearful and apocalyptic. IFPTE president Gregg Junemann, Maine AFL-CIO leader Matt Schlobohm, and, less effectively, RN Kathryn Donahue, from the California Nurses Association, all calmly made the point that labor’s ultimate solution is Medicare-for-all, not job-based private insurance coverage. Only UNITE-HERE’s D Taylor injected any organizing perspective into the debate; he called for union member mobilization to confront the politicians responsible for the current mess. Going Where Need is Greatest? Back in June, when Trumka was addressing the Labor Research and Action Network (LRAN) in Washington, D.C., he made his own preferred focus quite explicit. ”The labor movement needs to be not where we’ve been but where workers are most in need,” he told a LRAN conference at Georgetown Law School. At the same meeting, a Cornell professor circulated a paper which implied that labor’s shift in focus might be OK because existing union members weren’t really that needy anymore. According to this campus expert, “the labor movement is stronger than it looks…and most unions are doing an effective job at the bargaining table”—a truly astounding claim given management’s quite successful, non-stop drive for give-backs in both the private and public sector. Most in Trumka’s Alt-labor-oriented audience welcomed his remarks as another sign of labor’s creative rethinking of “what it means for working people to have a collective voice and real power…outside of traditional collective bargaining.” At the convention last week, this de-emphasis on the workplace problems of current dues-payers was reflected in what workshops were offered and/or rejected. In these very substantive “action sessions,” you could learn about the pressing occupational health and safety needs of workers in Bangladesh but there was no brainstorming about strengthening local safety committees in the U.S. or building the COSH movement here. Fighting give-backs, speed-up or job restructuring, organizing and winning strikes, mobilizing members on the job, creating a “stewards’ army”—face-to-face (as opposed to on-line)—did not get much playing time in the AFL’s “action session” line up. Labor’s biggest and most transformative public sector struggle since the 2011 “Wisconsin Uprising” was allotted a single presenter on the one panel (out of fifty) dealing with contract campaigns. Chicago Teachers Union (CTU) organizer Matt Luskin did a good job recounting how CTU reformers rebuilt their local union, as a precursor to taking on Mayor Rahm Emmanuel, with strong community support, in the second largest strike in the last two years. The moderator of this panel, a retired AFL-CIO headquarters staffer, seemed to miss Luskin’s message, however. He expressed the hope that greater militancy among existing union members might be inspired by low-wage worker strikes–when it’s the CTU model of organizational change, rooted in union democracy and reform, that’s far more relevant to other unionized teachers (and union members generally), than Fight For Fifteen or Our Walmart activity. 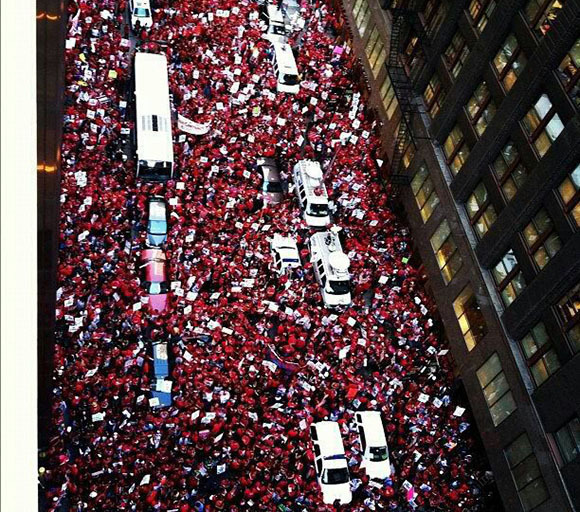 The Chicago Teachers Union on strike. As dissident academic Stanley Aronowitz noted several months ago, “Organized labor is still more than 15 million strong. ‘New’ labor movement? 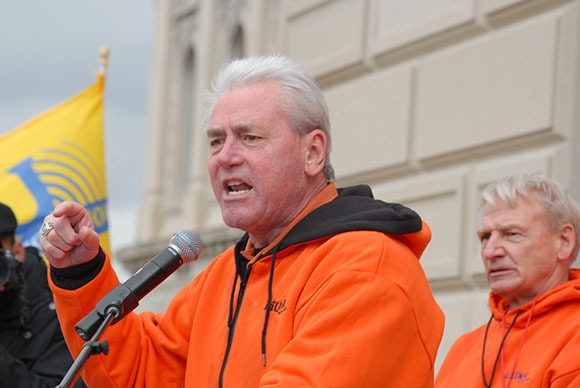 Why not seek reform of the existing unions?” But that topic is verboten at any AFL-CIO convention. There, affiliates like the American Federation of Teachers hover around worrying that the success of militant locals like CTU might lead to more local or national-level leadership challenges of the sort that brought real change to the UMW and Teamsters in the 1970s and 1990s respectively. Finally, dumbing down the very concept of “membership,” Working America-style, is not a “strategic shift” by the AFL-CIO; it’s a shell game that has little to do with real, long-term efforts to build workplace organization in the absence of employer recognition and bargaining rights. One example of those struggles is the decade long “minority union” campaign at T-Mobile. In a convention plenary report and later “action session” presentation, fired T-Mobile worker Josh Coleman and Communications Workers of America (CWA) president Larry Cohen provided a much-needed reality check on the AFL’s recent hype about “non-traditional” forms of organizing. As Cohen and Coleman acknowledged, building and sustaining TU, a voluntary membership organization of T-Mobile workers, has not been easy. 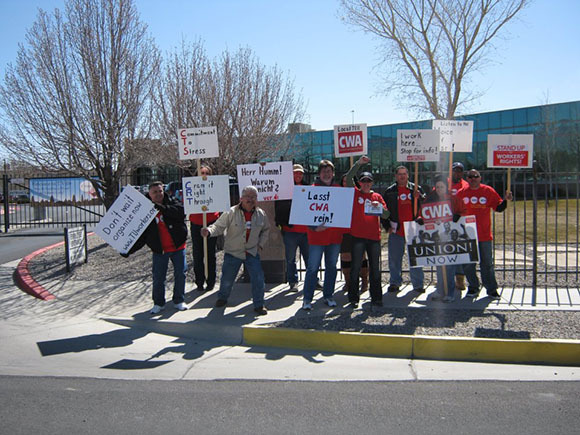 The effort has received strong support from ver.di, CWA’s “solidarity partner” in Germany, which represents 100,000 workers at T-Mobile’s parent company. Yet, even with active involvement of many CWA locals and their member-organizers, it has taken ten years of work to recruit 1,000 TU supporters in a union-eligible workforce of 20,000 or more. Only fifteen T-Mobile workers in Connecticut have been able to win contract protection so far. But workplace education, cross-border networking, direct action, publicity, legal complaints, and help from community allies has produced other TU gains. TU members at T-mobile stage a small but energetic demonstration. For similar union-building candor, plus equally valuable information sharing about organizing, bargaining, and strikes in sessions more geared to real action, attendance at Labor Notes’ own upcoming international conference would be more valuable than the AFL-CIO event. Labor Notes isn’t a meeting place that’s going to change the world of labor all by itself either. But the workplace perspective so MIA from the AFL convention will be on far greater display in Chicago next April 4-6. Alt-laborers and “old union movement” members alike will find common ground there, that’s far more solid than the official terra firma in La La Land last week.